It was very convenient to go to Gyeongju but I hope the guide could explain more about the history of the sites. 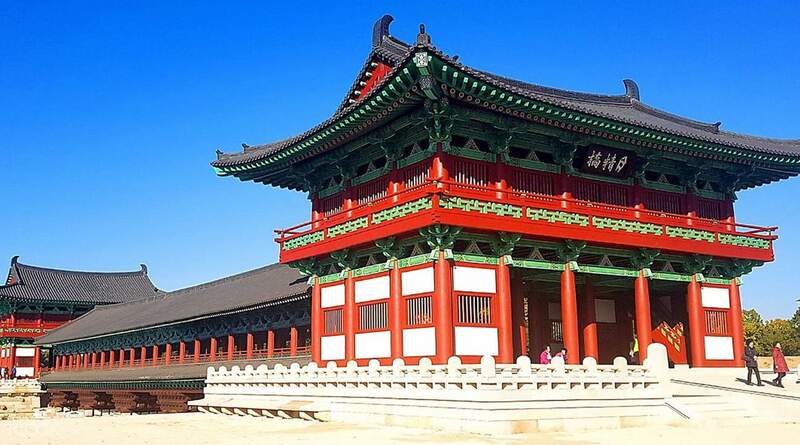 Take in the history of Gyeongju City, the capital of the thousand-year-old Silla Dynasty, and visit various traditionally beautiful locations all the way from Seoul in this historic tour! It's an early start when you depart from Seoul at 6:30am. The long ride to Gyeongju takes you to its first stop, Bulguksa Temple, the representative relic of the city which was designated as a World Cultural Asset by UNESCO in 1995. The temple is a religious architectural complex that is simply majestic to behold. 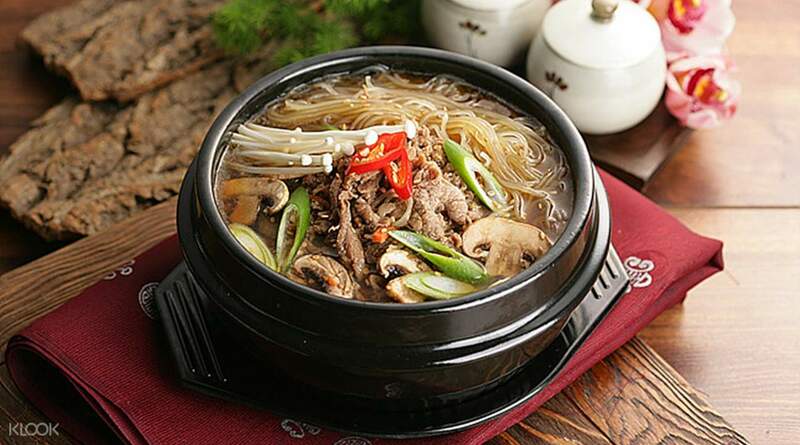 After, take a breather and have a Korean lunch (your choice of either bibimbap or Korean beef stew cooked inside a clay pot). Once your bellies are filled, head to Gyochon Hanok Village and Woljeong Bridge. 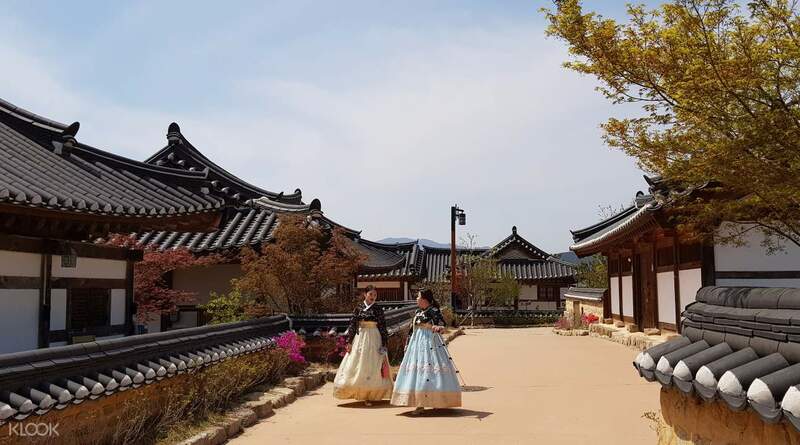 It's here where you'll be putting on a gorgeous Korean hanbok and take photos of yourselves amidst a beautiful traditional backdrop. Your final stop will be the Donggung Palace and Wolji Pond, a scenic palace complex with three small islands surrounded by an artificial pond - an overall peaceful view to take in. Leave Gyeongju learning more about Korea's history and legacy. This itinerary is for reference only and is subject to day-to-day circumstances such as traffic, weather, etc. We really love this Gyeongju trip. We were lucky to get a limousine service with a very nice driver. The long trip was so worth it. We did enjoyed the sceneries. We had so much fun wearing the hanbok. A very good lunch was also included in this trip. I always use Klook in my travels and I am always happy and satisfied. Thank you Klook! We really love this Gyeongju trip. We were lucky to get a limousine service with a very nice driver. The long trip was so worth it. We did enjoyed the sceneries. We had so much fun wearing the hanbok. A very good lunch was also included in this trip. I always use Klook in my travels and I am always happy and satisfied. Thank you Klook! We left as scheduled. The meeting place was easy to locate. The tour guide/ driver was very punctual in fact he was already at the meeting place minutes before the scheduled time. He knows how to relate and communicate with us even though he has difficulty with the english language. Bulguksa temple was not as solemn as I expected but it was still a nice experience. The lunch was superb! Best bibimbap I ever tasted. We had difficulty in going into Gyochon Hanok Village as traffic was bad. It turned out that it was a holiday and all people decided to go to said place☺️ anyway, the tour guide was able to secure a parking space despite the difficulty. The hannbok wearing experience was awesome☺️ it was a must try. Wolji Pond and Gueongju Donggung Palace was like a park as explained by the tour guide. We left as scheduled. The meeting place was easy to locate. The tour guide/ driver was very punctual in fact he was already at the meeting place minutes before the scheduled time. He knows how to relate and communicate with us even though he has difficulty with the english language. Bulguksa temple was not as solemn as I expected but it was still a nice experience. The lunch was superb! Best bibimbap I ever tasted. We had difficulty in going into Gyochon Hanok Village as traffic was bad. It turned out that it was a holiday and all people decided to go to said place☺️ anyway, the tour guide was able to secure a parking space despite the difficulty. The hannbok wearing experience was awesome☺️ it was a must try. Wolji Pond and Gueongju Donggung Palace was like a park as explained by the tour guide. 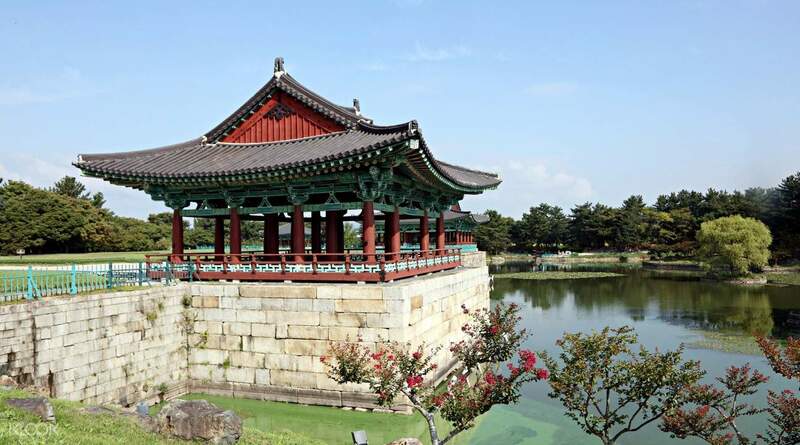 Hassle free travel from Seoul to Gyeongju. Beautiful historic place and very traditional villages. The tour guide has limited english knowledge but he is trying :) He also let us take a picture in Cheomseongdae and Pink Muhly grass even if it is not in the itinerary. I think its best to take this tour if you are already in Busan as it is one hour away from there. Hassle free travel from Seoul to Gyeongju. Beautiful historic place and very traditional villages. The tour guide has limited english knowledge but he is trying :) He also let us take a picture in Cheomseongdae and Pink Muhly grass even if it is not in the itinerary. I think its best to take this tour if you are already in Busan as it is one hour away from there. long travel but worth it 😍. the streets are full of cherry blossom trees during our visit! 😍 the service is on time.. must visit! long travel but worth it 😍. the streets are full of cherry blossom trees during our visit! 😍 the service is on time.. must visit! Gyeongju is a place for history buffs, as it was known to be Korea's ancient capital. It has too many ancient relics to be able to appreciate them in the short few hours I was there. 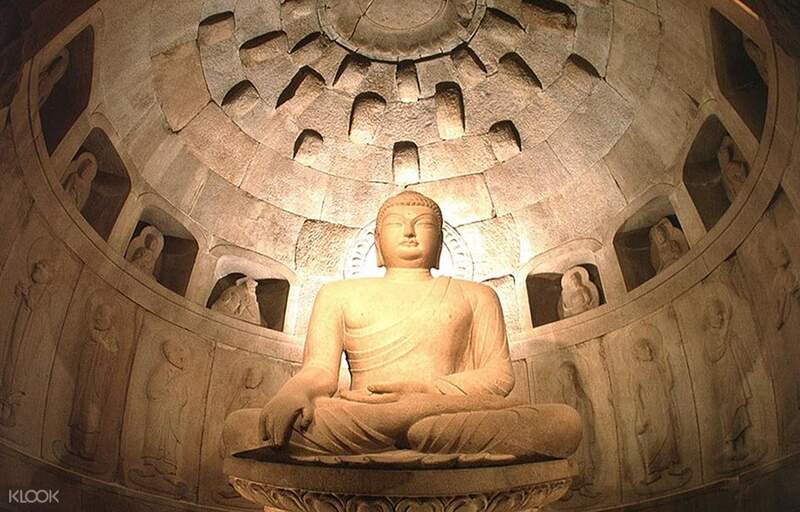 Gyeongju is also known as "The Museum without Walls". The cherry blossoms were fantastic! The trees were blooming everywhere! When the wind blows and the petals fall, the sight is so poetic! 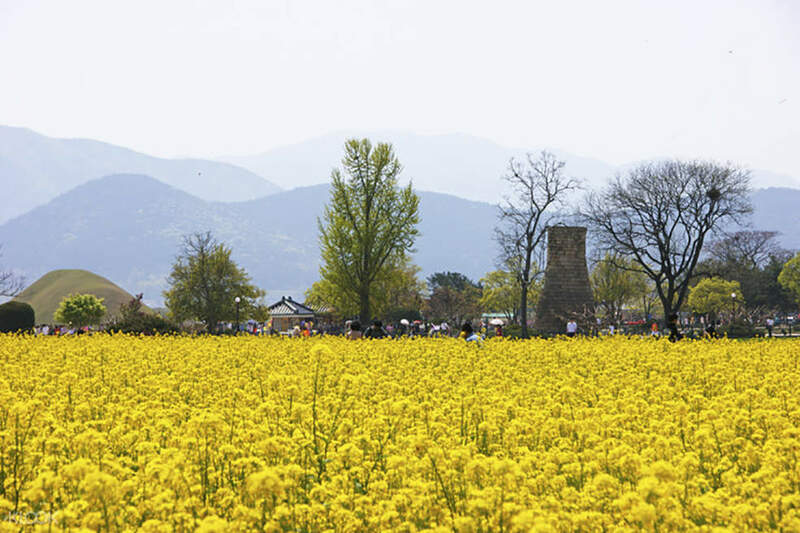 Gyeongju is a place for history buffs, as it was known to be Korea's ancient capital. It has too many ancient relics to be able to appreciate them in the short few hours I was there. Gyeongju is also known as "The Museum without Walls". The cherry blossoms were fantastic! The trees were blooming everywhere! When the wind blows and the petals fall, the sight is so poetic! Very good and friendly tour guide. Had fun taking pictures of the cherry blossoms. Very good and friendly tour guide. Had fun taking pictures of the cherry blossoms. A must for those who like less commercial places. The places we went to were beautiful, historic and spiritual. Me. Lee was a fun and kind tour guide. The only reason I’m giving this a four is the limited time we had to enjoy the places. Worth the 4 hour road trip each way. A must for those who like less commercial places. The places we went to were beautiful, historic and spiritual. Me. Lee was a fun and kind tour guide. The only reason I’m giving this a four is the limited time we had to enjoy the places. Worth the 4 hour road trip each way.